Biafra: Kanu's Family Host Biafran Elders Forum, Says "Our Son Will Never Abandon Biafra Restoration Project No Matter What"
The family of the leader of the Indeginous People of Biafra (IPOB), Mazi Nnamdi Kanu have stated that their son, will never dump the Biafra restoration project for 'Restructure'. His father (HRH Eze I.O Kanu) who welcomed the Biafra Elders Forum in his palace, literally expressed his joy over the release of his son. The inner joy currently being experienced by all were also seen on the faces of both his mother, Ugo Eze and the youngest sister, Princess Chinwe. Speaking to the Biafra Writers correspondent on ground, His Royal Majesty stated that the world jointly prayed for his son after it was clear to humanity that his son was incarcerated for nothing other than seeking for the freedom of his people. In his words, “The whole world prayed for that my son even when it was obvious that he was incarcerated for nothing. When the issue of secret trial was raised, I and the whole family were deeply perplexed. "My children were asking me from overseas, if this is what goes on in the Nigerian judiciary. I told them to relax that God has a way of doing things in his own way and His own time. Much later, they accepted to grant him bail, they came up with inviting a Jewish leader as a surety. I laughed and said, well, maybe they have discovered that my name is Israel Okwu Kanu. I thank God he is out and I am proud of that my son. If there is reincarnation, I would want to have such a son. He is focused, respectful and humble. Nnamdi is my first son whom I love dearly and he will never give up to the fight for our collective freedom”. The mother who couldn’t help but express great joy, thanked Chukwu Okike Abiama for the release of his son. She narrated her ordeals emotionally seeing her innocent child persecuted like a criminal. She wondered why anyone should expect Nnamdi to abandon his divine assignment of liberating his people after suffering unjustly for same cause. In her word, “Nnamdi is my son, I carried him for nine months in my womb and I know him as a child of destiny. He has a Mighty Hand of Chiukwu Okeke Abiama on him, he will never betray his people and I am in full support of his vision." The youngest sister, Princess Chinwe described Mazi Nnamdi Kanu as her “mentor, leader and her elder brother” thanked him for standing for millions of Biafrans all over the globe. She didn’t hide her support for the restoration of Biafra. 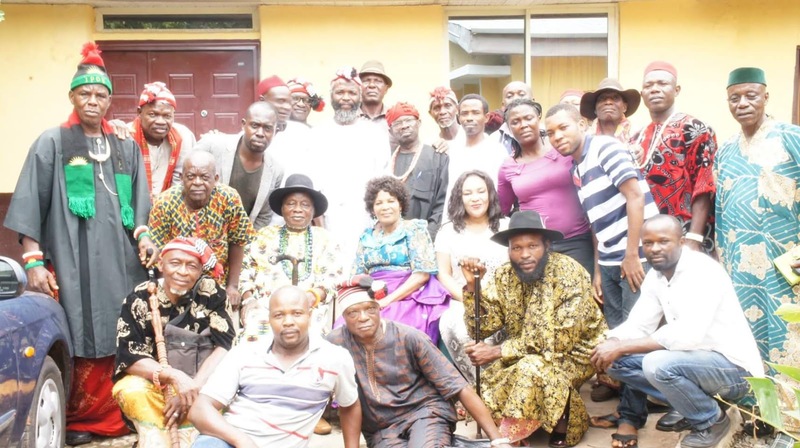 The leader of the Biafran Elders Forum thanked the Kanu family for their resolve towards supporting their son in this Biafra restoration project, he also told the parents that all the Biafran elders from various ethnic groups, Igala, Idoma, Igbanke, Ijaw, Ikwerre, Ibibio, Igbo etc were very happy to be hosted by his royal highness amd also rejoice with them over the release of their son Mazi Nnamdi Kanu.